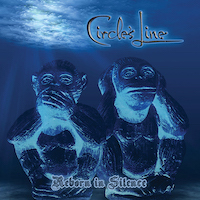 CIRCLE’S LINEis a Progressive Metal band from Northern Greece. They’ve been around since 2011, and released their second album, “Reborn In Silence”in January. Greece is, of course, no stranger to Prog Metal, as they claim one of the modern trailblazers of the genre, FIREWIND, which is a band that CIRCLE’S LINEis certainly emulating here. The band themselves come from parts of lesser-known Greek melodic metal acts, NEMESISand SPIDER KICKERS, who have both been around the scene since the mid-to-late 1980’s. Described as a passion project that was formed to pay respect to the legends of the genre, the group gives an earnest attention to each element of the mix. On opener “Beams of Light”, we hear the IRON MAIDENinfluence loud and clear, from the emotional, theatrical, often strained vocals from Tasos Karapapazoglou, to the throbbing Steve Harris-style bass that peaks through the mix. “A Face Like Me”has a kind of solipsistic quality, reminiscent of SAVATAGE’s “Handful of Rain”period. There’s a sterile quality to the drum sound throughout, sounding very electronic or trigger-based, that prevents songs like “Bloody Sunrise”and “Black Rain”, which both contain some intricate drum fills, from fully taking off. Though the album rarely deviates from it’s relatively straightforward aims, there are some different flavors abound, with “Prophet of Doom”sticking out with its complicated rhythms and dark imagery. Tasos’ vocals shine here, as does guitarist Panos Kaides’pinch harmonic-infused leads. Another standout track, “Mystical Ride”has a blazing lead right out of the gate with a space metal bent to it reminiscent of AYREON’s “Universal Migrator”records. Given the production restraints, loftier tracks like “Don’t Cry In The Morning Sun”tend to bite off more than they can chew. After awhile the bland sonics cause the album’s message to get lost along the way, with closer “Until I Die”feeling more like a whimper rather than a bang. With a minimalist home studio aesthetic, “Reborn In Silence,”serves to illustrate just how integral modern production techniques have been to forging the Prog Metal sound. Without the wall of full-spectrum sound, hundreds of layers of vocals, and triple-tracked guitars, you almost forget what is truly at the heart of the genre. The effect is that there’s a naive simplicity to this record that is endearing. It feels like the relatively primitive early classics of bands like LABYRINTH, CONCEPTIONor MOB RULES. The album cuts through the clutter and delivers melody, theatricality and adept musicianship, almost intravenously. There’s no thrills to be found, but it’s just solid, engaging music with a crisp attention to detail. For better or worse, it feels like 1996 all over again!